1. 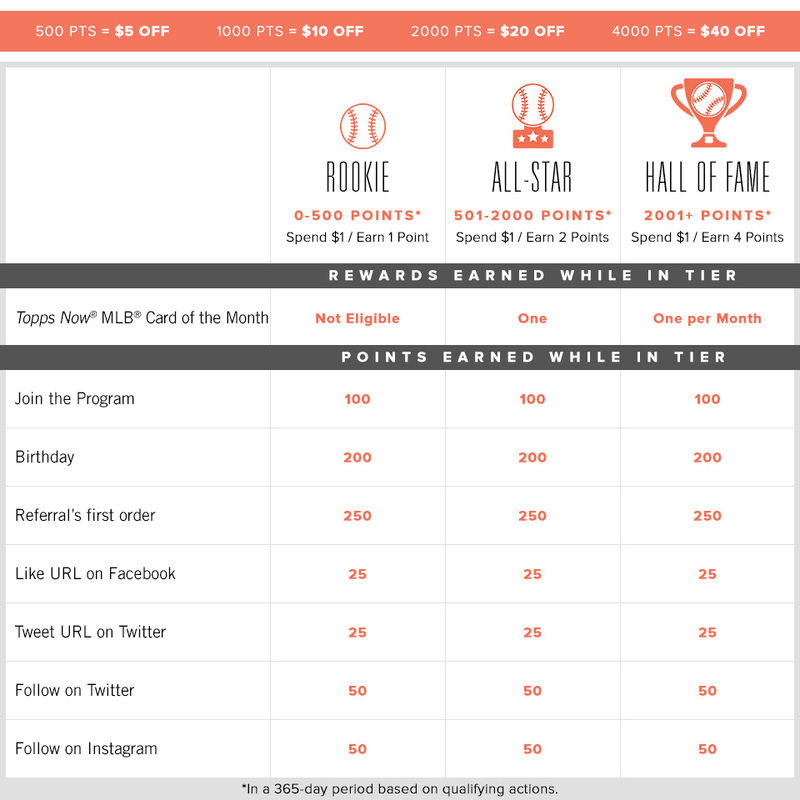 WHAT IS THE TOPPS NOW® LOYALTY PROGRAM? 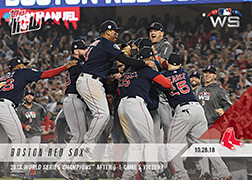 The TOPPS NOW® Loyalty Program is Topps’ NEW customer loyalty program that allows sports and entertainment fans – from Rookie to All-Star to Hall of Fame and beyond – to earn Points that can be redeemed for TOPPS NOW® products and to earn other perks. The Program is open to individuals who are legal residents of the United States (including its territories and possessions) who are at least 18 years old or the age of majority in the Member’s jurisdiction of residence, whichever is older, for their personal use only, and is limited to one (1) account per individual. 3. HOW DO I JOIN THE PROGRAM? Eligible individuals may enroll in the Program by creating an account, or by logging in to an existing account, on www.topps.com and agreeing to the PROGRAM TERMS. You may be required to provide your full name, mailing address, email address, and date of birth and to create a password in order to create an account. 4. WHAT AM I AGREEING TO BY JOINING THE PROGRAM? By joining the Program, you agree that you have read, understand and agree to be bound by the PROGRAM TERMS and by any changes or modifications we may make to those Program terms and conditions. You also agree to receive Program-related emails from us and our partners. 5. WHAT ARE THE TERMS OF THE PROGRAM? Please refer to the PROGRAM TERMS for the full list of Program terms and conditions. 6. HOW WILL YOU USE THE INFORMATION I PROVIDE THROUGH THE PROGRAM? The Program has 3 main Tiers – Rookie, All-Star, and Hall of Fame – as well as Platinum level membership. As you advance to the next main Program Tier, the faster you can earn Points to unlock Rewards. 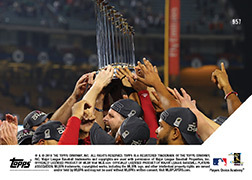 Rewards can be used toward TOPPS NOW® products available on www.topps.com. 8. WHAT ARE THE PROGRAM TIERS? There are 3 main Program Tiers – Rookie, All-Star, and Hall of Fame – as well as Platinum level membership. 9. WHAT ARE THE REWARDS? 10. HOW DO I EARN POINTS? You can earn Points by logging in to your account and then making qualifying purchases or taking qualifying actions. We may also, at our sole discretion, provide additional Points in connection with certain transactions and promotions. You may earn Points for dollars you spend on each qualifying transaction on www.topps.com, excluding federal, state, and local taxes, shipping charges, employee or other discounts, and items purchased with a gift card, merchandise credits, or any Rewards or other awards. Some purchases may be excluded from the Program, at Topps’ discretion. Some actions may require additional disclosures by you in order to qualify. Birthday Points are earned only if you provide your birthday information at least 1 month prior to your birthday date. 11. HOW DO I QUALIFY FOR EACH PROGRAM TIER? Program tiers are based on your qualifying purchases and actions in a rolling 365-day period. For the 365-day period after which you join the Program and/or enter a new Tier, you will earn Points from your qualifying purchases and actions based on the rate for that Tier. Your Tier level for the subsequent annual period will be based on Points you earn from your qualifying purchases and actions, starting the first day after your enrollment and/or entry into a new Tier and ending on or around Day 365. On Day 366, you may be placed in a different Tier depending on the number of Points you earn in the immediately preceding 365-day period, and your spend and actions register will be set at zero. You enter the All-Star level on May 1, 2017. You will earn Points at the All-Star rate through April 30, 2018. During that 365-day period, you earn 2050 Points. On May 1, 2018, your account will update to Hall of Fame level, and your spending and actions register will reset to 0. From May 1, 2018 through April 30, 2019, you earn Points at the Hall of Fame level but earn 400 Points. On May 1, 2019, your account will update to Rookie level, and your spending and actions register will reset to 0, and you will earn at the Rookie rate through April 30, 2020. *Members who were Topps.com account holders in 2016 will enter the Program in a Tier for purposes of Points earning rate based on his/her spend on qualifying purchases in calendar year 2016. Members who are creating a Topps.com account for the first time will enter the Program at the Rookie Tier level. 12. WHAT IS PLATINUM LEVEL? Platinum level is an invitation-only Program status offered to Program Members who have achieved and maintain Points beyond Hall of Fame in a preceding year. Members with Platinum status will receive special perks not available to other Tier levels. 13. HOW DO I QUALIFY FOR PLATINUM LEVEL? Platinum level status is by invitation only. 14. HOW DO I REDEEM POINTS FOR REWARDS? You may redeem Points for eligible Rewards by signing into your account. To redeem Points for a Reward, you must have a valid physical address linked to your account. Rewards may only be redeemed for Topps Now® products available on www.topps.com unless expressly authorized by Topps. You cannot combine Rewards with any other coupon or promotion. Rewards cannot be exchanged or returned for another product or service or a monetary refund. Points used to redeem a Reward will be deducted from the total Points available in your Member account; however, you will remain in your current Tier for its entire 365-period even if you use Points in your account. Points may not be used toward purchases of gift certificates, charitable items, promotional value sets, sales tax, or shipping charges. Credits from multiple accounts may not be aggregated unless authorized by Topps. Taxes on Rewards may apply where required by law. Any tax liability, including disclosure, is the sole responsibility of the Member. 15. WHEN WILL MY POINTS BE AVAILABLE? 16. HOW DO I CHECK MY MEMBER ACCOUNT STATUS? You can check your membership level and account status by logging into your account on www.topps.com and going to the “Loyalty” section on your dashboard. 17. WHAT IF MY POINTS ARE NOT SHOWING IN MY ACCOUNT? If you have concerns that a purchase or other action was not properly applied to your Member account, you should contact Topps Customer Service at support@topps.com and provide your name, address, phone number, and email address associated with your account, the date of the alleged purchase or action, and the issue(s) you encountered. This email must be sent within forty-five (45) days after the alleged purchase or action took place. We are not responsible for late notifications regarding purchases or actions not being credited to a Member account. 18. DOES MY MEMBERSHIP EVER EXPIRE? While your membership may remain open, Points will expire after twelve (12) months of inactivity, a period in which a Member earns no Points, makes no qualifying purchases, takes no qualifying actions, and redeems no Points. 19. CAN MY MEMBERSHIP BE REVOKED? Your membership may be revoked by Topps, in its sole discretion, at any time. Any abuse of the Program; failure to follow any of these Terms; membership inactivity for more than twelve (12) months; misrepresentation; or conduct that may be detrimental to Topps or our interests may result in the revocation of your membership and make you ineligible for further participation in the Program. If, in Topps’ sole discretion, we suspect fraud, misrepresentation, abuse, or violation of these Terms, we also have the right to take appropriate legal action. 20. WHAT HAPPENS TO MY POINTS IF MY MEMBERSHIP IS REVOKED? If your membership is revoked, any Points or Rewards in your account or available to you prior to such termination will automatically expire, and your access to the Program and its features will automatically terminate, in Topps’ sole discretion. 21. CAN THE PROGRAM BE MODIFIED OR TERMINATED? Yes. Topps may, in its discretion, cancel, amend, modify, restrict, and/or terminate the Program, the Program Terms, or any aspect or feature of the Program, at any time without prior notice, even if such changes may affect Points already earned and/or the value of Rewards already accumulated and/or the ability to redeem Rewards. 22. WHAT HAPPENS TO MY POINTS IF THE PROGRAM IS TERMINATED? If the Program is terminated, any Points or Rewards in your account or available to you prior to such termination will automatically expire, and your access to the Program and its features will automatically terminate, in Topps’ sole discretion. 23. HOW DO I UPDATE MY MEMBER ACCOUNT INFORMATION? To update your Member account information, you must log in to your www.topps.com account. Once logged in, you can update your Member information on the Account Dashboard by clicking on the “Account Information” and “Address Book” tabs. 24. WHAT DO I DO IF I FORGOT MY PASSWORD? If you have forgotten your password, go to the Log In page and click on the “Forgot Password” link. You will then be prompted to enter the email address associated with your www.topps.com account, and a temporary password will be emailed to that email address. Follow the prompts in the email to create a new password. 25. HOW DO I TERMINATE / CANCEL MY PROGRAM MEMBERSHIP? If you decide you no longer want to be part of the Program, you may cancel your membership at any time by contacting Topps Customer Service at support@topps.com. Your email must specify your name, address, phone number, and email address associated with your account, and confirm that you wish to be removed from the Program. It may take up to 7 business days for your cancellation to complete. 26. WHAT HAPPENS TO MY POINTS IF I TERMINATE / CANCEL MY PROGRAM MEMBERSHIP? STILL HAVE QUESTIONS? CONTACT CUSTOMER SERVICE VIA EMAIL AT SUPPORT@TOPPS.COM.